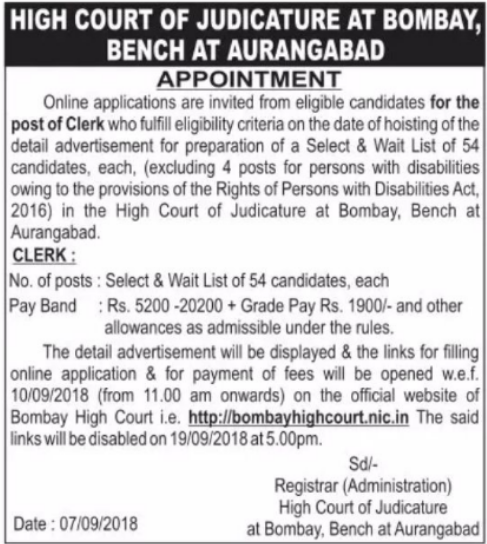 Bombay High Court has invited online applications from qualified candidates for Clerk Posts in the court. The candidates will be selected on the basis of performance in written test and/or interview. The total number of vacancies is 54. The applications have to be submitted online on the official website of Bombay High Court, the link for which is given at the end of the post. The candidates have to submit the applications on or before the last date i.e 19th September 2018. All the important details like educational qualifications, pay scale etc. are mentioned in the official notification. This is a good opportunity to work in the Bombay High Court.